Cool Box Portable Storage offers top quality service that PODS® storage, and other competitors, can’t beat. We deliver a superior product, affordable prices, and an amazing customer support team. We deliver our product with NO hidden charges. Many portable storage companies, such as PODS® storage, will offer you a low monthly fee only to charge you enormous add-on costs for transportation and delivery. We strive to bring the best rates, services, and reliability to each and every one of our valued customers. With all the hassles and problems while moving, there is no need to add any more stress to the equation. With our fast and simple service, you’ll have a moving or storage unit when you need it. We will deliver to a location of your choosing, drop the portable storage unit off, and pick it up when you need it moved. It’s a great service that relieves the stress and hassle of moving and storage. The best part is that if we store your unit at one of our secure yards, you can schedule a visit to your container by contacting our specialists 24 hours in advance. Our service has the benefits of self-storage while offering the portability needed to make moving and storage simple. It’s everything you need, available to you when you need it; with a lower price than PODS and other competition. 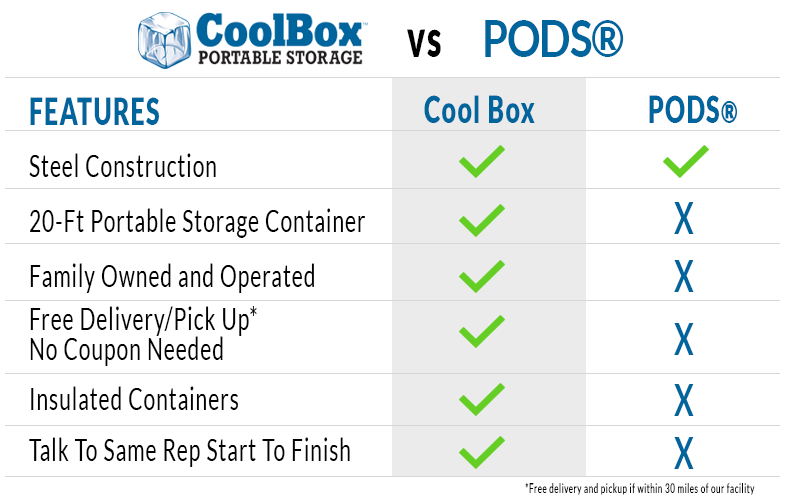 If you don’t believe us, check out the chart below to see how we stack up against PODS storage and other competitors. We strive to make our costs the best around while providing quality service. 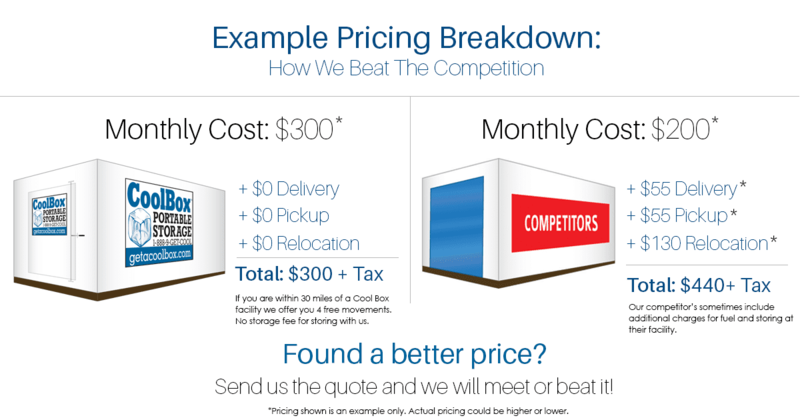 That’s why, if you find any comparable competitor’s price lower than ours, we will match the price for all local deliveries. Give us a call today to find out how Cool Box Portable Storage can help you with all your moving and storage needs. *Same day delivery is dependent on availability. Not Available during our busy months: April – September. PODS® is the registered trademark of PODS Enterprises, Inc. (PEI).